I am writing this blog because of some of the bad practice i have heard about in the solar installation industry, however i should point out that the majority of installers are reputable and will do a great job, but there are some simple checks you can do by asking the right questions to make sure your installer is one of them. 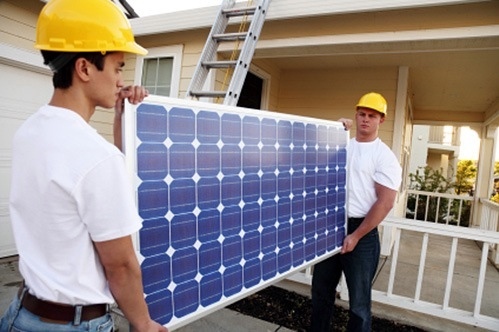 Installing solar power should be a big decision and should be carefully considered. You should get all of the information you need before making this decision and certainly before parting with any cash. Firstly any installer or surveyor should visit you in your home before giving you a quotation. Looking on google earth is not a substitute for this. Your surveyor should ensure that you are fully informed about the feed in tariff scheme and how it works. You can only apply for the feed in tariff scheme if your installer is microgeneration certification scheme qualified – you should ask to see their certificate to prove this. Other certificates you should ask for are: their REAL assurance scheme membership, this will ensure that they protect the deposit that you pay by insuring it, so if they go out of business you will not lose your money. You should also ask for their public liability insurance certificate. Any installers who have an excuse for not presenting any of these 3 documents should be avoided. Your installer should also cover the following by carefully measuring – not by looking and having a guess. Which roof: it is not always obvious which roof you should install your panels on, for example your roof may face east and west with no obvious south facing aspect. So do you use east or west? This depends on several aspects: slope, horizon, shading, geograhical location. All should be considered and your installer should be able to justify and quantify which roof is the best. Ask for their reasoning and why they. Recommending the roof. System size: do you want the maximum size system that you can fit? If so thats fine. If your installer recommends a system larger than 3.6 kilowatts, you should question whether your district network operator will allow this and get written proof from them before proceeding. Shading: shading is a crucial consideration and should be carefully measured and worked out for any system. Any direct shading, such as by a chimney can have a massive impact on the output of your solar array. Returns: before paying any deposit your installer should forecast the energy generation and therefo financial returns you can expect. In this calculation they should factor in all of the measurements above, ask to see their logic and method in performing this calculation. It should make sense and the installer should sound like they know what they are talking about. Is your installer providing any other services? What is their aftercare, maintenance? How does your warranty work? How do you get on the feed in tariff scheme? Do you need to apply for planning permission? If your installer can answer all of these then the are probably worth their salt. Solar panels do work, they do pay back, you will make a profit and you will be very happy that you made the decision to switch to solar. Provided a good job is done by your installer.